For us NYC history nerds, the New York Public Library‘s digital archive is one of the most valuable tools. We can search historic photos by address, building name, or neighborhood. This can get a little tedious, though, especially if a location no longer exists or we don’t know the exact street number. But sleuthing for vintage pictures just got a whole lot easier thanks to a new mapping tool from the library’s NYPL Labs team. OldNYC is an interactive map that features red dots on every location for which the collection has photos from the 1870s through the 1970s and lets you explore and interact with the images. The map was created over 18 months by Dan Vanderkam, a software engineer and data expert extraordinaire. When you click a red dot, you’ll see thumbnails of all the corresponding images for that location. These can all be blown up larger, and, for many, this reveals descriptions about the photos. At this point, users have the option to share the photo on their social media channels or add their own comments. All of the 80,000+ images are from the NYPL’s Milstein Collection. They’re attributed to many photographers, but 30,000 are courtesy of Percy Loomis Sperr, who documented changes to the city from the late 1920s to the early 1940s. He was a Staten Island-based commercial photographer hired by the library. 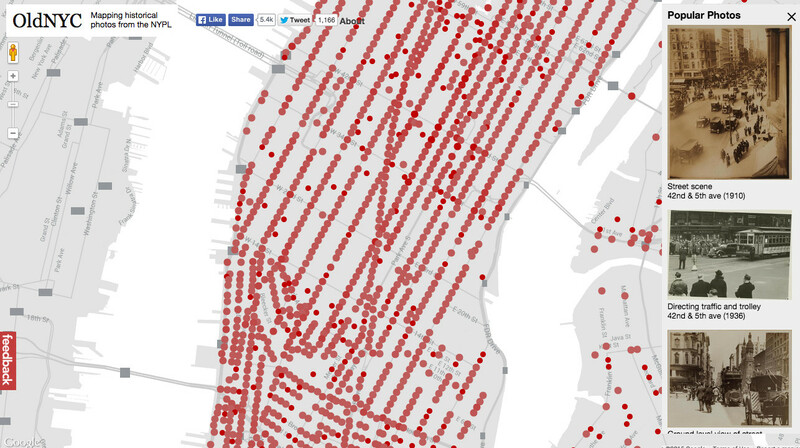 Browse through the entire OldNYC map here.